Many of you have seen the "Web Special" banner ad on my website advertising for an "All Aluminum Overnight" for only $17,995. 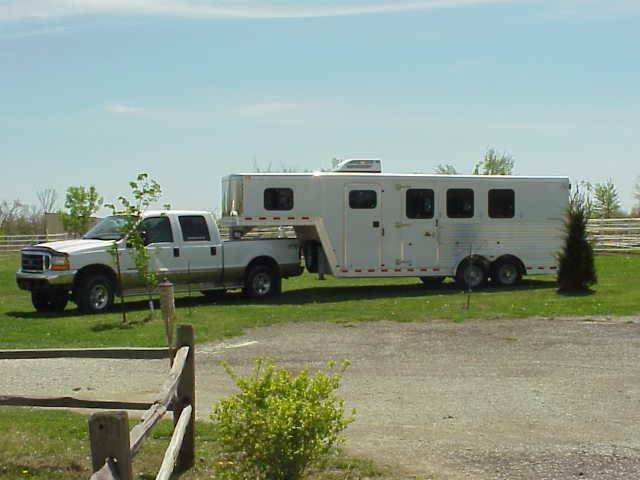 It's a picture of a Kiefer Built 3-horse gooseneck. Well I was real curious what you could actually purchase for that kind of money - So I asked them to send me one. Here's what I got. I have to admit I was skeptical. The original price was $16,995. 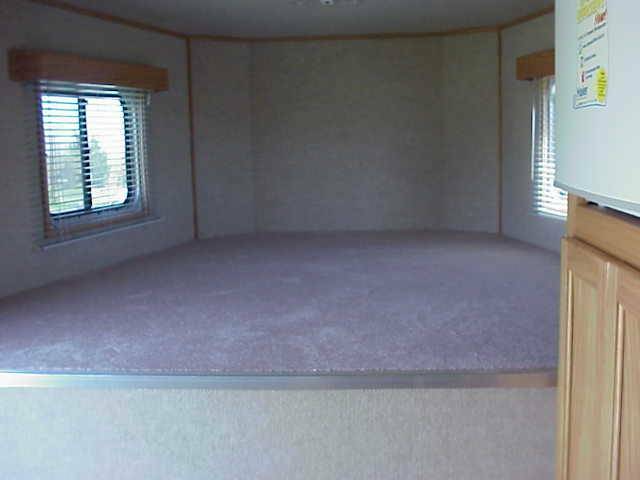 So how much "living" quarters could you get from a price that normally delivers a similar trailer without a finished dressing room. I was curious. But the concept was simple. 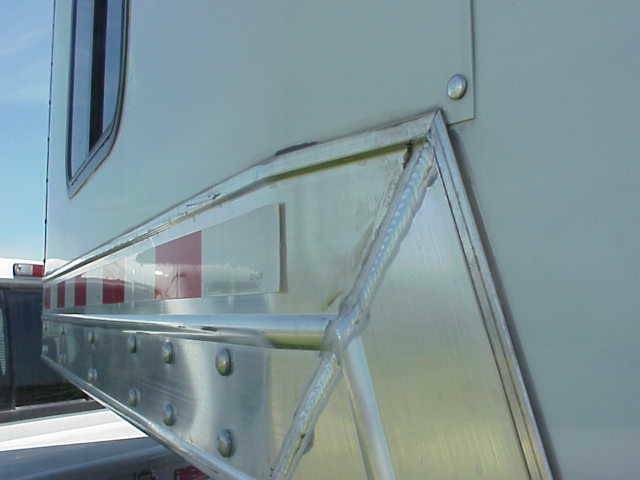 Trailer America works with you on designing your trailer . . . places the order for you, then contacts you when it's ready . . . . you can even pick it up and save delivery charges. Not that this is a new idea . 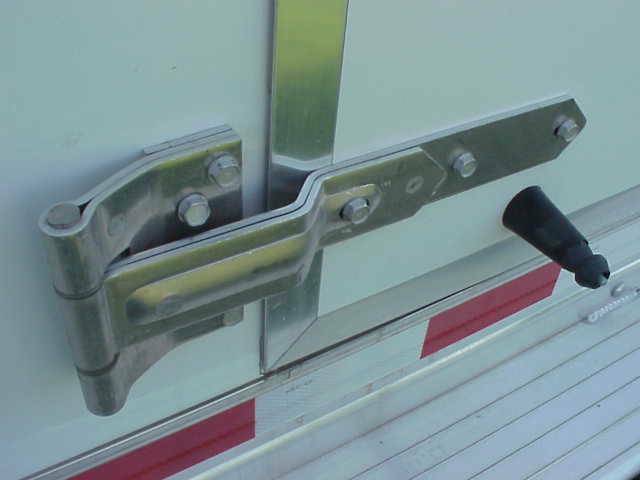 . . but Trailer America is looking for volume and is willing to reduce the margin . .passing the savings on to you. And what about service? You are better off letting them explain it. Bottom line . . . if it's covered in your purchase agreement . . . get it fixed locally. 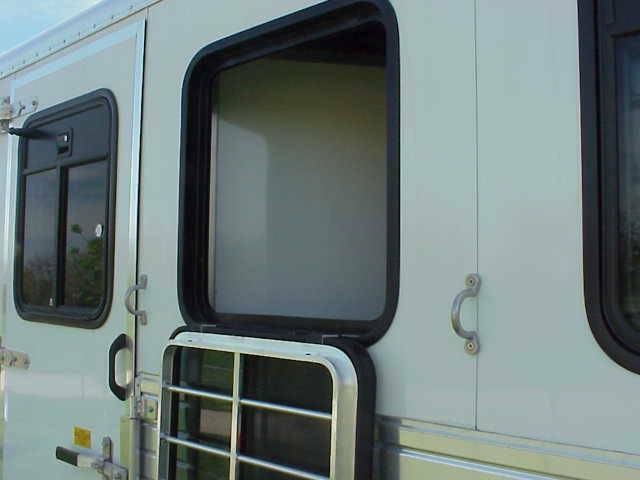 RV service centers are often the best bet. Trailer America will stand behind it. So what did I find? I took delivery in early May and as usual, my wife was the first to comment. "hmmmm." She commented. "Not a bad looking rig." Then she went about her work, but five minutes later she was out by the trailer. "Kiefer makes a sharp looking unit," was her simple statement. "I like it. A lot." Admittedly, our previous experience with Kiefer was limited to a two-horse steel model we pulled over a dozen years ago . . . . and it was blunt and plain. 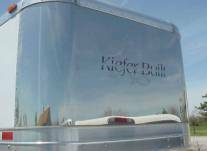 Like many folks, we just weren't up on the fact that Kiefer made a quality aluminum product at a good price . . . . and built them with the same care and reputation as in the past. But we were dying to know what the "Weekend Package" looked like. We opened the dressing room door to look inside. In a word, Wow! Quite a change from your standard dressing room. 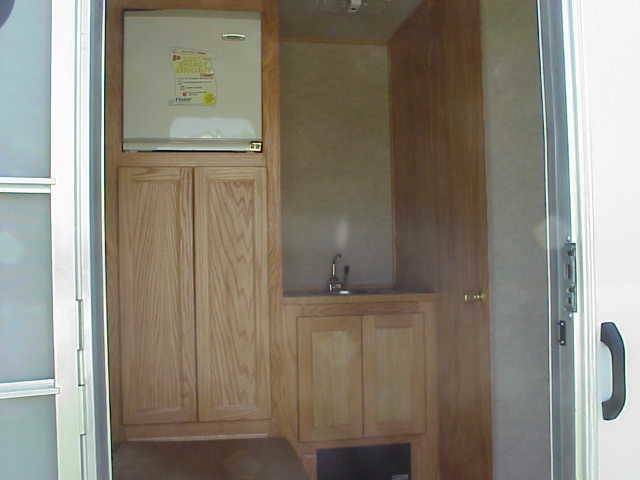 The Web Special was completely finished with a refrigerator, and sink and cabinets. 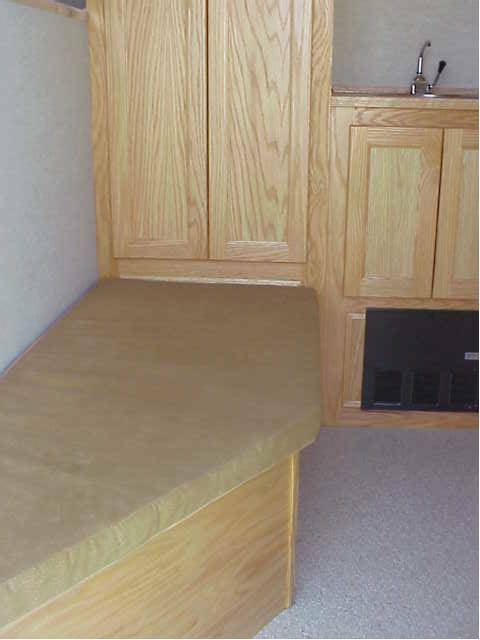 The bench was angled to accommodate the water tank and provide an adequate place to sit. 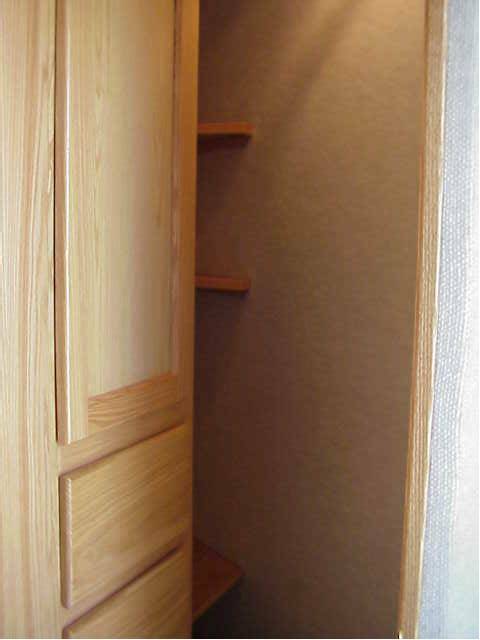 There is a large storage closet with adequate room to place your own port-a-potty if you wish. So what is a "Weekend" package and why would you want one? Not to be confused with a full living quarters, a Weekend Package may vary according to your own requirements. 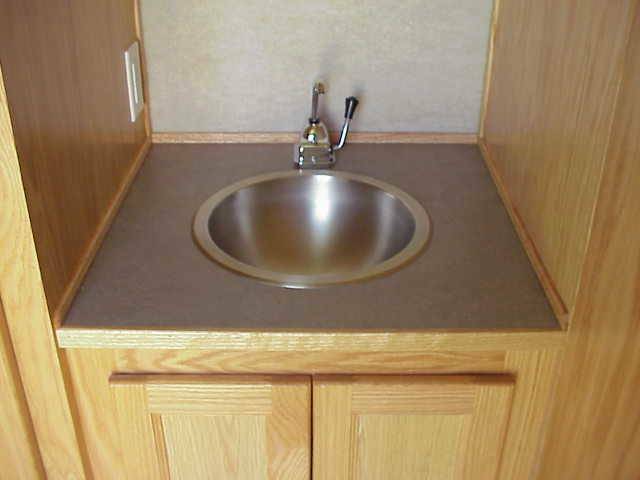 But it's primary role is giving you a comfortable and clean place to spend the night. Simple as that. 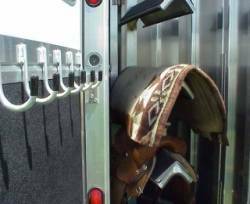 If you're like most folks, and you hit the shows and rodeo's in the hot summer, you'll quickly learn that it's often convenient to be able to lay over a night and not have to leave your rig and horses. Air conditioning makes the difference between a miserable night and one that's restful. The unit shipped to me had an air conditioning unit installed - and to me, a weekend package wouldn't be complete without it. While you may find it difficult to always find a place to plug in - I would strongly advise the purchase of a generator. 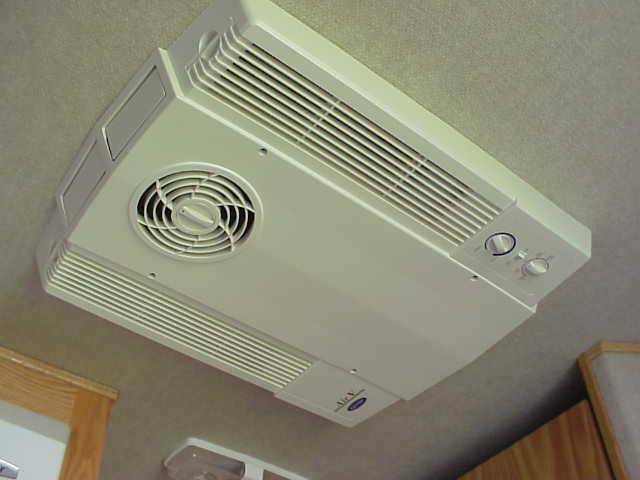 They come in many sizes but you need to match the power available with that of your air conditioning unit, and then some. 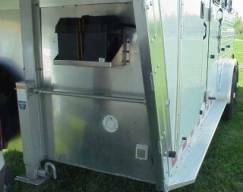 The generator is a useful investment to have around the farm whether you load it in the back of the truck for the weekend, or have it handy at home. A clean place to sleep. A refrigerator for keeping food and beverages cold. A cool respite from the blistering heat. A conveniently clean place to keep your clothes looking nice. A place to change, relax and get out of the weather for short periods in comfort. About the Kiefer Built. 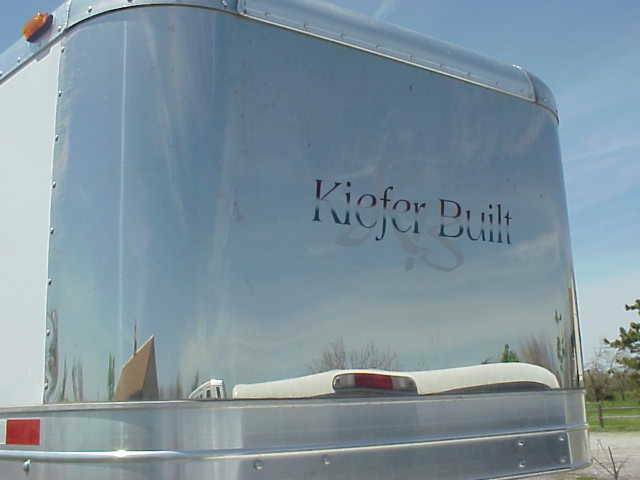 Built in Iowa, Kiefer has a long history of building quality trailers and standing behind their name. 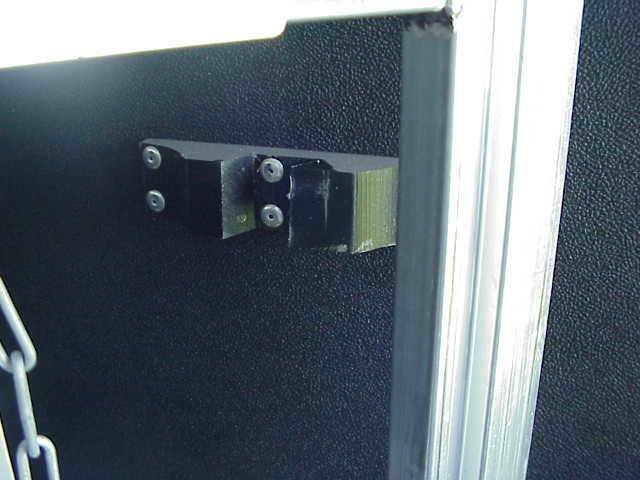 We found the Kiefer Genesis well-constructed and were impressed with the latches, hinges and especially the tight fitting seals around the doors. 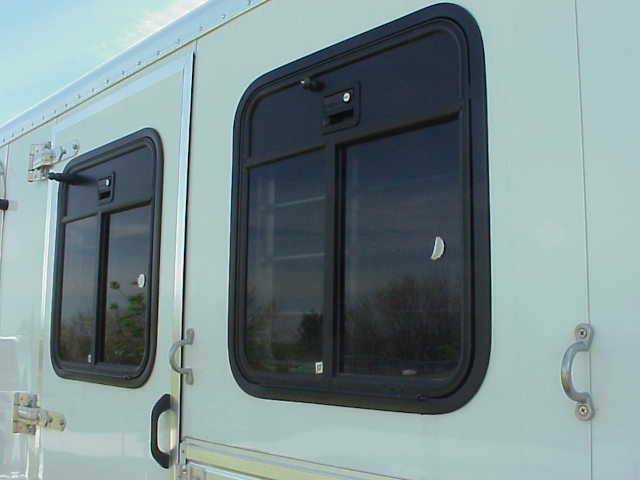 It pulls easily and comes standard with drop down window bars to facilitate open windows and air-flow while hauling. 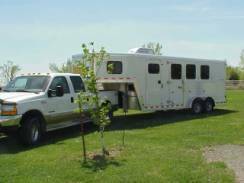 The total weight for a Genesis GN 3-horse is 4,260 lbs but don't forget to expect more weight when adding the finished weekend package. 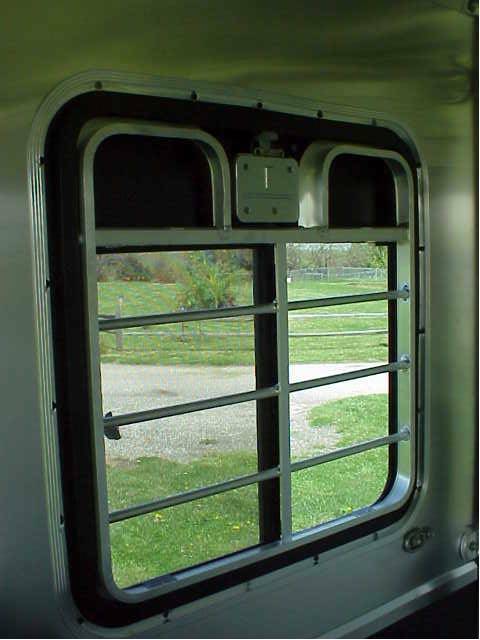 The interior walls of the horse compartment are lined and insulated all the way to the roofline. 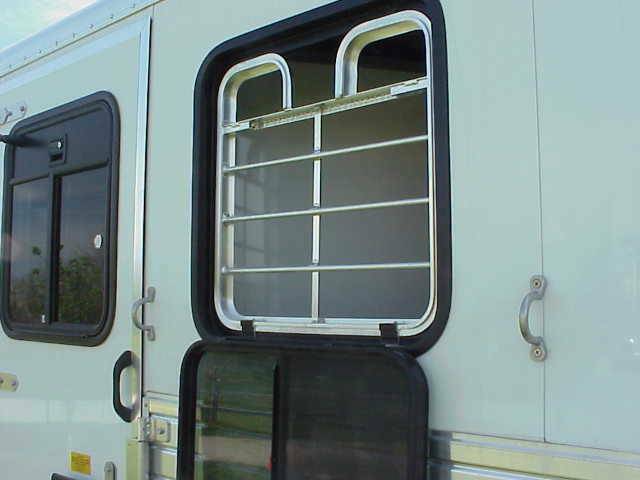 It also includes a collapsible rear tack with a removable center post, roof venting for each horse, 18" x 24" windows and three interior dome lights. Little amenities include six bridle hooks, feed bag rings, 60/40 rear doors and rubber kick mats on the side walls . . . all standard. It's a nice trailer. 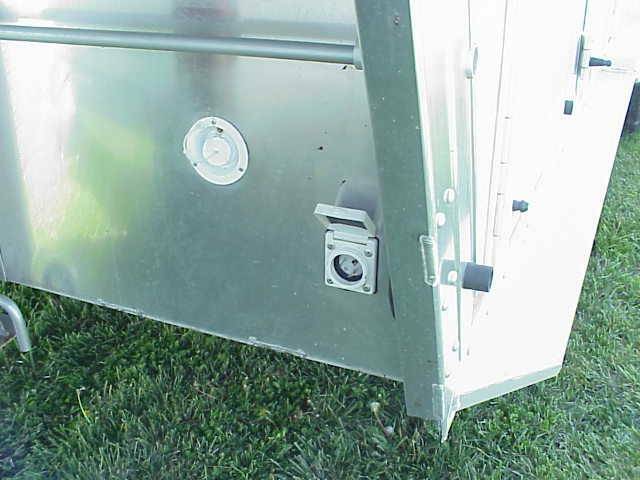 Water fill access for the storage tank is conveniently located in the front, next to your power plug-in. An auxiliary battery is included. 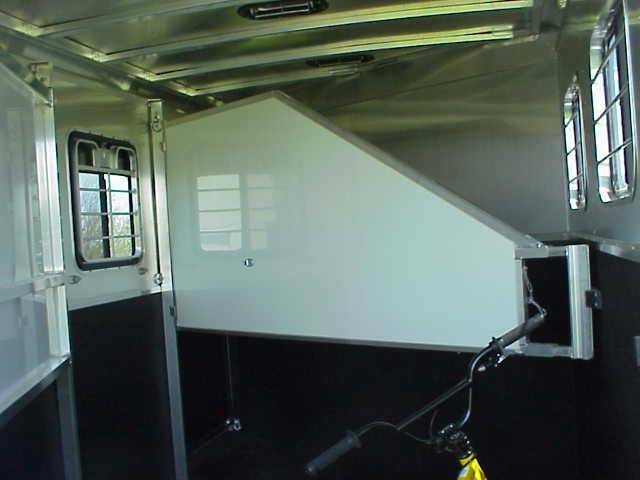 If you are considering a Weekend Package, an aluminum trailer, a quality name, at a very reasonable price, I would have to give the "Weekend Special" a high recommendation. A product is only as good as the people who stand behind it . 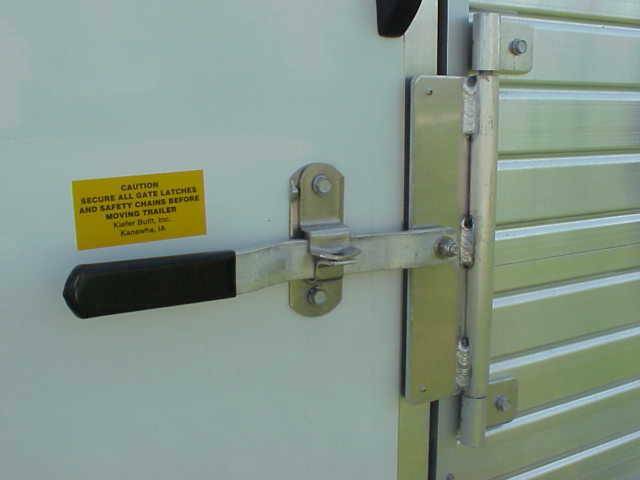 . . and I've had excellent communication between the folks at Trailer America through this entire process. They are clear about expectations and identify well with your own particular needs. Do your research and know what you want. Then I'd be comfortable with giving an outfit like this the opportunity to put together a package for you. And finally, a little bit about the pricing. 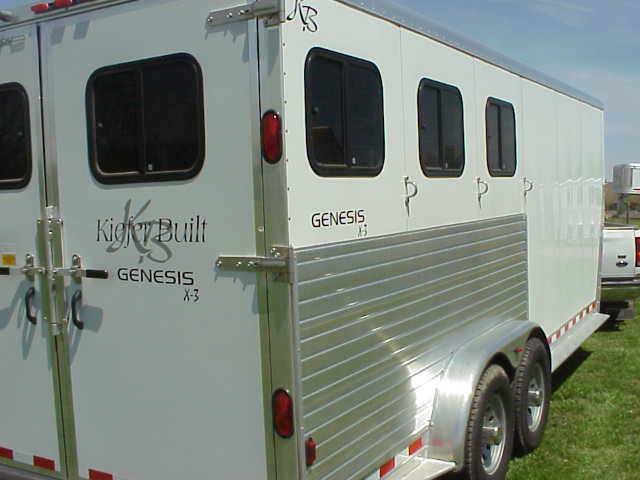 Kiefer lists the Genesis 3-Horse GN featured here for $16,499 - without the Weekend Package. For $17,995 you can buy this same trailer finished WITH the Weekend Package. This includes everything you see on this review trailer, but the air conditioning is extra. 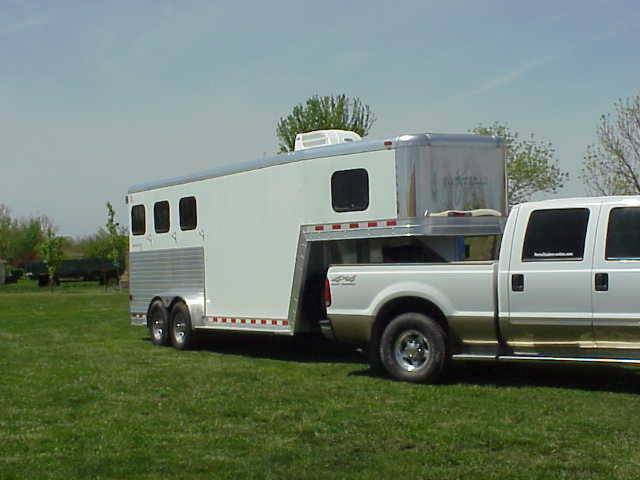 � Copyright 2000-2002 HorseTrailerWorld.com and horsetrailerworld.com. All rights reserved including digital rights.